The Battle of South Mountain, which was also known as the Battle of Boonsboro Gap was fought on September 14, 1862. 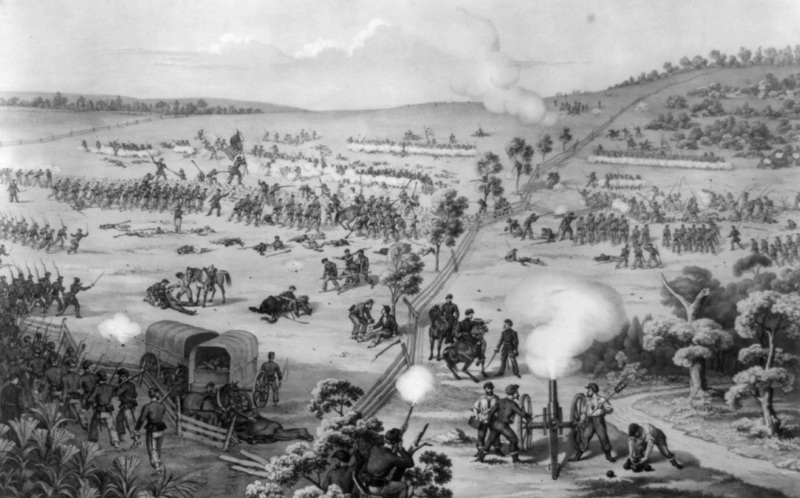 Three separate battles were fought for possesion and control of the three passes through the South Mountain: Crampton's, Turner's and Fox's Gap. Major General George B. McClellan, commanding the Army of the Potomac needed to move his troops through the mountain passes in order to pursue General Robert E. Lee. Lee's forces while outnumbers managed to delay the Union forces before withdrawing back to Sharpsburg, Maryland and Antietam. Out of 28,000 Union troops engaged 443 soldiers were killed, 1,807soldiers were wounded, 75 missing & captured for a total of 2,325. The Eighty-Eighth was detailed for wagon guard and suffered no loses. Out of 18,000 Confederate troops engaged, 325 soldiers were killed, 1,560 soldiers were wounded, 800 missing & captured, for a total of 2,685.